Objective To evaluate if two different measures of synovial activation, baseline Hoffa synovitis and effusion synovitis, assessed by MRI, predict cartilage loss in the tibiofemoral joint at 30 months follow-up in subjects with neither cartilage damage nor tibiofemoral radiographic osteoarthritis of the knee. Methods Non-contrast-enhanced MRI was performed using proton density-weighted fat-suppressed sequences in the axial and sagittal planes and a short tau inversion recovery sequence in the coronal plane. Hoffa synovitis, effusion synovitis and cartilage status were assessed semiquantitatively according to the WORMS scoring system. Included were knees that had neither radiographic osteoarthritis nor MRI-detected tibiofemoral cartilage damage at the baseline visit. The presence of Hoffa synovitis was defined as any grade ≥2 (range 0–3) and effusion synovitis as any grade ≥2 (range 0–3). Logistic regression was performed to examine the relation of the presence of either measure to the risk of cartilage loss at 30 months adjusting for other potential confounders. Results Of 514 knees included in the analysis, the prevalence of Hoffa synovitis and effusion synovitis at the baseline visit was 8.4% and 10.3%, respectively. In the multivariable analysis, baseline effusion synovitis was associated with an increased risk of cartilage loss. No such association was observed for baseline Hoffa synovitis. Conclusions Baseline effusion synovitis, but not Hoffa synovitis, predicted cartilage loss. The findings suggest that effusion synovitis, a reflection of inflammatory activity including joint effusion and synovitic thickening, may play a role in the future development of cartilage lesions in knees without osteoarthritis. In order to analyse the possible link between early synovial activation and later structural deterioration we wished to assess if knees without tibiofemoral radiographic osteoarthritis and without cartilage damage but with evidence of MRI-detected Hoffa synovitis or effusion synovitis (composite score of joint fluid and synovial thickening) are at an increased risk of cartilage loss at 30 months follow-up when compared with knees without these baseline features of synovial activation. Subjects were participants in the Multicenter Osteoarthritis (MOST) Study, a prospective epidemiological study of 3026 persons aged 50–79 years, with a goal of identifying risk factors for incident and progressive knee osteoarthritis in a sample either with osteoarthritis or at high risk of developing disease. Participants at high risk included those who were overweight or obese, had knee pain, aching or stiffness on most of the last 30 days, or had a history of knee injury that made it difficult to walk for at least 1 week, or had had previous knee surgery. Subjects were recruited from two US communities, Birmingham, Alabama and Iowa City, Iowa, through mass mailing of letters and study brochures, supplemented by media and community outreach campaigns. The study protocol was approved by the institutional review boards at the University of Iowa, University of Alabama, Birmingham, University of California, San Francisco and Boston University Medical Campus. Subjects were excluded from MOST if they screened positive for rheumatoid arthritis,24 had ankylosing spondylitis, psoriatic arthritis, Reiter's syndrome, had renal insufficiency that required haemo or peritoneal dialysis, a history of cancer (except for non-melanoma skin cancer), had or planned to have bilateral knee replacement surgery, were unable to walk without assistance, or were planning to move out of the area in the next 3 years.25 Subjects were further excluded if a diagnosis of rheumatoid arthritis or related diseases was established between the baseline and the follow-up visit. Figure 1 gives a detailed overview of the inclusion process for the present analysis. Flowchart of knee inclusion. ACL, anterior cruciate ligament; KL, Kellgren–Lawrence; OA, osteoarthritis; TF, tibiofemoral. At baseline, all subjects underwent weight-bearing posteroanterior fixed flexion knee radiographs using the protocol by Peterfy et al26 and a plexiglass positioning frame (Synaflexer, Synarc, San Francisco, California, USA). A musculoskeletal radiologist and a rheumatologist experienced in reading study films, both blinded to case/control status and clinical data, graded all posteroanterior films according to the Kellgren–Lawrence (K/L) scale. Radiographic tibiofemoral osteoarthritis was considered present if the K/L grade was 2 or greater. If readers disagreed on the presence of radiographic osteoarthritis, the film readings were adjudicated by a panel of three readers. At the baseline clinic visit long-limb films were acquired with a 14-in × 51-in cassette. Mechanical alignment was measured as the angle formed by the intersection of the femoral and tibial mechanical axes. The femoral mechanical axis is the line from the centre of the femoral head through the centre of the knee, and the tibial mechanical axis is drawn as a line from the centre of the ankle to the centre of the knee. Neutral alignment was defined as 179–181°, varus malalignment as 178° or less and valgus malalignment as 182° or greater. MRI were obtained in both knees with a 1.0T dedicated MR system (OrthOne; ONI Medical Systems, Inc., Wilmington, Massachusetts, USA) with a circumferential extremity coil using fat-suppressed fast spin echo PDw sequences in two planes, sagittal (TR 4800 ms, TE 35 ms, 3 mm slice thickness, 0 mm interslice gap, 32 slices, 288×192 matrix, two excitations (NEX), 140 mm2 field of view (FOV), echo train length (ETL) 8) and axial (TR 4680 ms, TE 13 ms, 3 mm slice thickness, 0 mm interslice gap, 20 slices, 288×192 matrix, 2 NEX, 140 mm2 FOV, ETL 8), and a short TI inversion recovery sequence in the coronal plane (TR 6650 ms, TE 15 ms, TI 100 ms, 3 mm slice thickness, 0 mm interslice gap, 28 slices, 256×192 matrix, 2 NEX, 140 mm2 FOV, ETL 8). Two musculoskeletal radiologists, blinded to clinical data, read bone marrow lesions (BML) and cartilage status according to the whole-organ MRI score (WORMS) method.4 Baseline and follow-up MRI were read paired and with the chronological order known to the readers. MRI features were assessed simultaneously. Signal alterations in the infrapatellar and intercondylar regions of Hoffa's fat pad were scored from 0 to 3 as a surrogate for synovial thickening according to the literature as this feature is not part of the original WORMS system.11 13 18 We will refer to these scores as ‘Hoffa synovitis’ in the following sections, although acknowledging that these signal changes also include non-specific alterations not necessarily related to synovitis22 (figure 2A). (A) Sagittal proton density-weighted magnetic resonance image. Grade 2 Hoffa synovitis is shown in the infrapatellar (arrow) and intercondylar (arrowhead) regions of Hoffa's fat pad. (B) Axial proton-density weighted magnetic resonance image. Grade 2 joint effusion synovitis is depicted as fluid-equivalent signal within the joint cavity (black arrowheads). Marked capsular distension is present. Note incidental finding of a metaphyseal enchondroma in the distal femur (white arrowheads). WORMS uses a combined measure of joint effusion and synovitis based on the amount of intra-articular fluid-equivalent signal. This composite score is graded from 0 to 3 according to the estimated maximal distension of the synovial cavity and was applied in addition to the mentioned signal changes in Hoffa's fat pad (figure 2B).4 We will refer to this scoring measure as ‘effusion synovitis’ in the following sections to acknowledge both constituents of the composite score. Cartilage signal and morphology were scored according to the WORMS system from 0 to 6 in 14 articular surface regions. In a modification of WORMS developed for longitudinal readings, a score of within-grade worsening for cartilage assessment was introduced to reflect any subtle within-grade progression that did not fulfil the criteria of a full-grade change. Any change including within-grade and full-grade or greater increases in cartilage damage in at least one of 10 tibiofemoral subregions was defined as cartilage loss.2 14 In addition, BML and meniscal damage were assessed according to the WORMS system at baseline. BML size was scored from 0 to 3 based on the extent of regional involvement. Meniscal status was graded from 0 to 4 in the anterior horn, the body segment and the posterior horn of the medial and lateral meniscus. Furthermore, meniscal extrusion of the medial and lateral meniscal body was scored on the coronal plane according to previous publications as this feature is not part of the WORMS score.27 28 The inter-reader reliability (weighted κ) for the readings of the different features was 0.62 for BML, 0.65 for both synovitis and joint effusion, 0.65 for meniscal extrusion, 0.78 for cartilage morphology and 0.80 for meniscal status. Knees that showed typical radiological signs of traumatic bone contusions, osteonecrosis, fracture or malignant bone infiltration were excluded from the analysis. However, of all analysed MRI only one knee showed a subacute tibial depression fracture at follow-up and was excluded. In order to minimise possible misclassification errors of low-grade Hoffa synovitis and effusion synovitis versus normal imaging findings, Hoffa synovitis was defined as any grade 2 or greater and effusion synovitis as any grade 2 or greater (figures 1 and 2). Knees with scores of either 0 or 1 were the reference. We compared the frequencies of cartilage loss in knee plates according to the presence or absence of Hoffa synovitis and effusion synovitis using χ2 statistics. We examined the association between baseline Hoffa synovitis and the risk of tibiofemoral cartilage loss using the logistic regression model. In the multivariable regression model, we adjusted for age, gender, body mass index, knee malalignment and other structural lesions (ie, patellofemoral cartilage damage, meniscus damage, meniscal extrusion, BML and effusion synovitis). We used the same approach to examine the relation of effusion synovitis with the risk of tibiofemoral cartilage loss. In this analysis we also adjusted for Hoffa synovitis. In an additional analysis we included only knees without any cartilage damage in all 14 articular subregions including the patellofemoral joint. Furthermore, we explored whether a lower threshold of ‘definite’ Hoffa and effusion synovitis yielded comparable results (using grades 0 only as the reference). All statistical calculations were performed using SAS software (version 9.1 for Windows). As shown in table 1, of 514 subjects (514 knees) included in the analysis, the average age at baseline was 60 years and 56% were women. The mean body mass index was 29.1 kg/m2. The majority (92.8%) of knees had a K/L grade of 0, and the remaining knees (7.2%) had a K/L grade of 1. Seventeen per cent of the knees had frequent pain symptoms, and more than 60% knees had either varus or valgus malalignment. Eighty-five (16.5%) subjects recalled a history of injury to the examined knee badly enough to limit walking for at least 2 days and 14 (2.7%) knees had surgery. At the baseline visit the majority of knees had not or only exhibited low-grade (ie, grade 1) BML, meniscal damage or meniscal extrusion. Slightly more than 9% of knees showed Hoffa synovitis (grade >1) and 10.3% presented with effusion synovitis (grade >1; table 2). Concerning anatomical distribution in regard to articular plates, cartilage loss occurred most frequently in the retropatellar subregions (17.5% of knees) and medial weight-bearing femur (15.0% of knees). Only 6.6% of knees exhibited cartilage loss in the lateral weight-bearing femur. Cartilage loss was more frequently observed in the lateral tibia in knees with Hoffa synovitis when compared with knees without signs of Hoffa synovitis. Furthermore, cartilage loss was more frequently observed in the medial and lateral weight-bearing femur in knees with effusion synovitis. The anatomical distribution of cartilage loss is presented in table 3. Of 137 knees with cartilage loss in any of the tibiofemoral subregions, 45 (32.9%) also had tibiofemoral joint space narrowing progression on the x-ray. As shown in table 4, baseline Hoffa synovitis was not associated with an increased risk of cartilage loss at follow-up (adjusted OR 1.0, 95% CI 0.5 to 2.1; p=0.89). However, knees with baseline effusion synovitis had an increased risk of cartilage loss (adjusted OR 2.7, 95% CI 1.4 to 5.1; p=0.002). We performed an additional analysis by limiting the knees that had no cartilage damage in all 14 articular subregions, including the patellofemoral joint (n=85). Of them, only two knees showed any grade 2 Hoffa synovitis or effusion synovitis, 24 (28.2%) knees showed grade 1 Hoffa synovitis and 16 (18.8%) exhibited grade 1 effusion synovitis at baseline. During the follow-up period, only 13 (15.3%) knees developed any cartilage loss, thus prohibiting us from assessing the association between either Hoffa synovitis or effusion synovitis and the risk of cartilage loss. Using grade 0 only as the reference group neither baseline Hoffa synovitis nor effusion synovitis was associated with an increased risk of cartilage loss at follow-up (adjusted OR 0.9, 95% CI 0.6 to 1.3; p=0.48 and adjusted OR 1.5, 95% CI 0.9 to 2.3; p=0.11). In knees without radiographic osteoarthritis we identified baseline joint effusion and synovitis assessed by a composite MRI measure, which we termed ‘effusion synovitis’ as a predictor of future cartilage loss over a 30-month period. The imaging surrogate of signal alterations in Hoffa's fat pad that we termed ‘Hoffa synovitis’ was not predictive of later cartilage loss. We adjusted our results for possible confounders of future cartilage loss and thus could show that baseline effusion synovitis as assessed on non-enhanced MRI is an independent predictor of cartilage deterioration and might play an important role in disease initiation. Osteoarthritis is usually classified as a non-inflammatory disease as the leucocyte count in osteoarthritis synovial fluid is typically below the threshold defining an ‘inflammatory’ disorder.29 However, synovial activation is commonly observed in osteoarthritis. Clinically, it manifests itself typically as ‘flares’ of pain.30 On imaging and arthroscopy increased synovial thickness, hypervascularisation and proliferation of hypertrophic and hyperaemic synovial villi are observed.6 13 15 18 21 Histology shows hypertrophy and hyperplasia with an increase in the number of synovial lining cells and infiltration of mononuclear cells, with activated T cells, B cells and macrophages being the major components of the synovial infiltrate.19 31 The mediators affecting the activation of synovial macrophages have not been clearly identified, but are thought to to be caused by breakdown products of cartilage or meniscal degradation.7 8 Our results neither support nor contradict this hypothesis. Although we have analysed knees without any MRI-detectable cartilage damage, early cartilage degradation before being visually apparent on MRI may have been present. The synovial activation we have observed in the form of synovitis and effusion might thus have been triggered by these breakdown products. On the other hand, synovitis and effusion might have direct effects on cartilage matrix integrity that triggers further cartilage breakdown including surface damage.7 Also stretching of the joint capsule as a result of effusion with consequent joint laxity leading eventually to microtrauma and possibly cartilage damage might play a role. As one of the main aims of our study was to assess the change in cartilage over time, the MRIs were read not blinded to the time point. This might result in a slight tendency to read more change in comparison with a blinded reading. However, it has been shown that scoring without knowing the chronological sequence substantially decreases sensitivity in the detection of clinically relevant changes in comparison with scoring in chronological order, and that it does not introduce false-positive changes.39 40 These studies showed that blinding to the time point can lead to misclassification of the longitudinal change in a feature and that it may compromise the assessment of the relation of that feature and its outcome.41 However, we have to acknowledge that to date longitudinal osteoarthritis studies comparing semiquantitative MRI assessment blinded and non-blinded to chronological order are missing. As there were only a few knees without any cartilage damage in both the tibiofemoral and patellofemoral joints, we included knees without tibiofemoral cartilage damage and without or with patellofemoral cartilage lesions. Adjustment was performed for the presence of patellofemoral cartilage damage as a possible confounder of subsequent cartilage loss. We did not analyse clinical symptoms or functional parameters at baseline or follow-up as this was not the focus of our study and would have gone beyond the scope of this work. However, several studies have shown that synovitis seems to be strongly associated with pain and is clinically relevant.12 13 23 Subjects who developed an inflammatory disorder such as rheumatoid arthritis or a related disease between baseline and the follow-up visit were excluded from the analysis. In summary, we found that baseline joint effusion and synovitis assessed on non-enhanced MRI in knees without tibiofemoral radiographic osteoarthritis but at risk of developing osteoarthritis are predictors of later cartilage loss. The two MRI measures applied to non-contrast-enhanced images showed different results and the composite measure of effusion and synovitis seemed to be predictive, whereas Hoffa's signal changes were not. This leads to the assumption that joint effusion might play an additional role in predicting cartilage loss. Contrast-enhanced MRI needs to verify these findings in the future. Our results support the importance of further research in the field of the targeted inhibition of synovial activation in early osteoarthritis in order eventually to avoid progressive cartilage degradation and functional impairment. The authors would like to thank the participants and staff of the MOST Study at the clinical sites in Birmingham, Alabama and Iowa City, Iowa and at the Coordinating Center at UCSF, San Francisco, California.
. Meniscal tear in knees without surgery and the development of radiographic osteoarthritis among middle-aged and elderly persons: The Multicenter Osteoarthritis Study. Arthritis Rheum 2009;60:831–9.
. Change in MRI-detected subchondral bone marrow lesions is associated with cartilage loss: the MOST Study. A longitudinal multicentre study of knee osteoarthritis. Ann Rheum Dis 2009;68:1461–5.
. Whole-organ magnetic resonance imaging score (WORMS) of the knee in osteoarthritis. Osteoarthr Cartil 2004;12:177–90.
. The validation of simple scoring methods for evaluating compartment-specific synovitis detected by MRI in knee osteoarthritis. Rheumatology (Oxford) 2005;44:1569–73.
. Magnetic resonance imaging in osteoarthritis: which method best reflects synovial membrane inflammation? Correlations with clinical, macroscopic and microscopic features. Osteoarthr Cartil 2009;17:1186–92. , Osteoarthritis and inflammation – inflammatory changes in osteoarthritis synoviopathy. In: Buckwalter J, Lotz M, Stoltz J-F, eds. Osteoarthritis, Inflammation and Degradation: A Continuum. Amsterdam, NL: IOS Press, 2007:219–35.
. Prevalence of cartilage shards in synovium and their association with synovitis in patients with early and endstage osteoarthritis. J Rheumatol 1992;19:1247–51.
. Articular responses to purified cartilage proteoglycans. Arthritis Rheum 1988;31:258–66.
. Investigation of calcium crystals in OA knees. Rheumatol Int 2010;30:623–31.
. Knee effusions, popliteal cysts, and synovial thickening: association with knee pain in osteoarthritis. J Rheumatol 2001;28:1330–7.
. Relation of synovitis to knee pain using contrast-enhanced MRIs. Ann Rheum Dis 2010;69:1779–83.
. Synovitis detected on magnetic resonance imaging and its relation to pain and cartilage loss in knee osteoarthritis. Ann Rheum Dis 2007;66:1599–603.
. Tibiofemoral joint osteoarthritis: risk factors for MR-depicted fast cartilage loss over a 30-month period in the multicenter osteoarthritis study. Radiology 2009;252:772–80.
. Synovitis: a potential predictive factor of structural progression of medial tibiofemoral knee osteoarthritis – results of a 1 year longitudinal arthroscopic study in 422 patients. Osteoarthr Cartil 2005;13:361–7.
. Synovial tissue inflammation in early and late osteoarthritis. Ann Rheum Dis 2005;64:1263–7.
. The association of meniscal damage with joint effusion in persons without radiographic osteoarthritis: the Framingham and MOST osteoarthritis studies. Osteoarthr Cartil 2009;17:748–53.
. Synovial thickening detected by MR imaging in osteoarthritis of the knee confirmed by biopsy as synovitis. Magn Reson Imaging 1995;13:177–83.
. Synovial inflammation in patients with early osteoarthritis of the knee. J Rheumatol 1990;17:1662–9.
. The reliability of a new scoring system for knee osteoarthritis MRI and the validity of bone marrow lesion assessment: BLOKS (Boston Leeds Osteoarthritis Knee Score). Ann Rheum Dis 2008;67:206–11.
. Anatomical distribution of synovitis in knee osteoarthritis and its association with joint effusion assessed on non-enhanced and contrast-enhanced MRI. Osteoarthr Cartil 2010;18:1269–74.
. Hoffa's fat pad: evaluation on unenhanced MR images as a measure of patellofemoral synovitis in osteoarthritis. AJR Am J Roentgenol 2009;192:1696–700.
. Reversible MRI features and knee pain fluctuation: the MOST study. Arthritis Rheum 2011;63:691–9.
. A connective tissue disease screening questionnaire for population studies. Ann Epidemiol 1995;5:297–302.
. Comparison of fixed-flexion positioning with fluoroscopic semi-flexed positioning for quantifying radiographic joint-space width in the knee: test–retest reproducibility. Skeletal Radiol 2003;32:128–32.
. The association of meniscal pathologic changes with cartilage loss in symptomatic knee osteoarthritis. Arthritis Rheum 2006;54:795–801.
. Change in joint space width: hyaline articular cartilage loss or alteration in meniscus? Arthritis Rheum 2006;54:2488–95.
. Synovial fluid cell analysis. Baillieres Clin Rheumatol 1996;10:519–34.
. Clinical assessment of osteoarthritis in clinical trials. Curr Opin Rheumatol 1995;7:87–91.
. T-cell mediated inflammatory pathway in osteoarthritis. Osteoarthr Cartil 1999;7:401–2.
. Macroscopic and microscopic features of synovial membrane inflammation in the osteoarthritic knee: correlating magnetic resonance imaging findings with disease severity. Arthritis Rheum 2005;52:3492–501.
. The incidence and natural history of knee osteoarthritis in the elderly. The Framingham Osteoarthritis Study. Arthritis Rheum 1995;38:1500–5.
. Is obesity a risk factor for progressive radiographic knee osteoarthritis? Arthritis Rheum 2009;61:329–35.
. A comparison of dedicated 1.0 T extremity MRI vs large-bore 1.5 T MRI for semiquantitative whole organ assessment of osteoarthritis: the MOST study. Osteoarthr Cartil 2010;18:168–74.
. The value of water-excitation 3D FLASH and fat-saturated PDw TSE MR imaging for detecting and grading articular cartilage lesions of the knee. Skeletal Radiol 2003;32:396–402.
. Prevalence of pathologic findings in asymptomatic knees of marathon runners before and after a competition in comparison with physically active subjects – a 3.0 T magnetic resonance imaging study. Skeletal Radiol 2008;37:627–38.
. Semiquantitative assessment of focal cartilage damage at 3T MRI: a comparative study of dual echo at steady state (DESS) and intermediate-weighted (IW) fat suppressed fast spin echo sequences. Eur J Radiol 2010 Sep 10. [Epub ahead of print] PMID:20833493.
. Detecting radiological changes in rheumatoid arthritis that are considered important by clinical experts: influence of reading with or without known sequence. J Rheumatol 2002;29:2306–12.
. Blinded reading of radiographs increases the frequency of errors in vertebral fracture detection. J Bone Miner Res 1996;11:1793–800.
. Blinding images to sequence in osteoarthritis: evidence from other diseases. 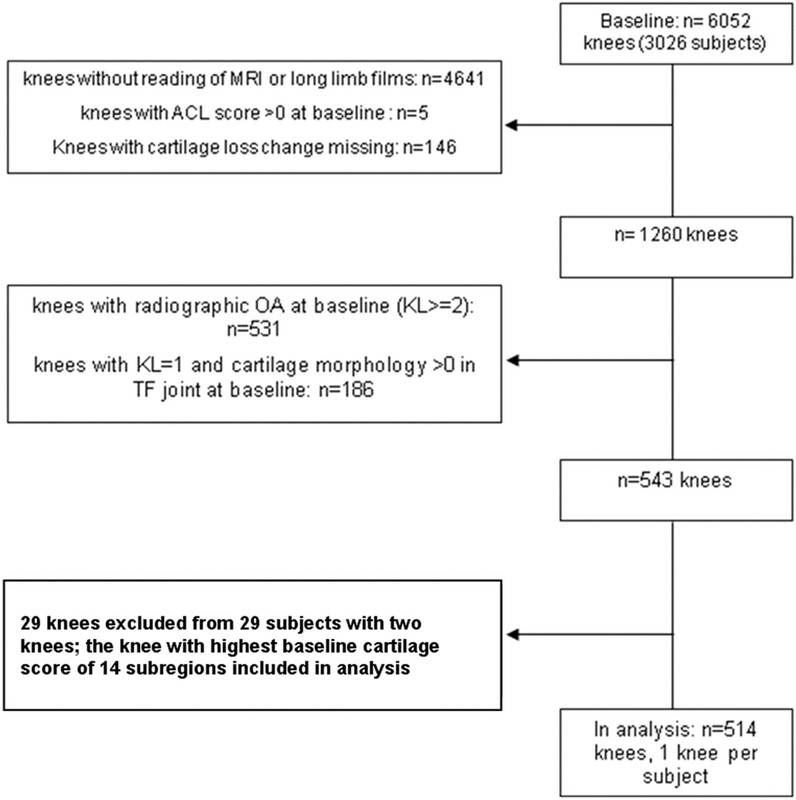 Osteoarthr Cartil 2009;17:281–3.
. MRI prevalence of different features of knee osteoarthritis in persons with normal knee x-rays. Arhritis Rheum 2007;56(Suppl):S128. Funding This study was supported by NIH grants from the National Institute of Aging to CEL (U01-AG-18947), JT (U01-AG-18832), MCN (U01-AG-19069) and DTF (U01-AG-18820) and NIH AR47785. Competing interests AG has received consultancies, speaking fees and/or honoraria (less than US$10 000 each) from Facet Solutions, Genzyme and Stryker, and (more than US$10 000) from Merck Serono, and is the President of Boston Imaging Core Lab (BICL). He receives research grants from General Electric Healthcare. FWR is vice president and a shareholder of BICL. MDC is a shareholder of BICL. None of the other authors have declared any possible conflict of interest. Ethics approval This study was conducted with the approval of the University of Iowa, University of Alabama, Birmingham, University of California, San Francisco and Boston University Medical Campus.